Liaoning has played a important role in China’s history, as an important trade centre and as the stronghold of the emperors of the Qing Dynasty. In Liaoning’s capital city, Shengyang, a Manchurian version of the Forbidden City was built. Shenyang’s Imperial Palace was built on the same principles as the larger one in Beijing. 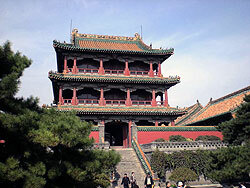 It now houses a large collection of art and relics from the Ming and Qing dynasties. The same emperors who built it also built their own burial site in the city, the Fuling Tombs. Liaoning has many scenic attractions, including Yunguang Cave in the mountains of Jiu Ding, said to be the origin of Taoism in the north. Liaoning has numerous coastal cities. Dalian, in particular, has become a popular resort town. Walking along the streets of this charming garden-town, one will notice the beach on one side and mountains on the other. These natural beauties provide the perfect backdrop for the Russian- and Japanese-style buildings scattered throughout the city. The best time to visit Liaoning is between May to October, for its windy springs and autumns, and pleasant and rainy summers. In winter, ice and winter festivals are held throughout the province.